Weekly Science Quiz: You've got c-mail? How does one go about discovering a particle so small that nobody can see it? The British physicist J.J. Thomson won the Nobel prize in 1906 for doing just that—discovering the electron. At Cambridge University, Thomson was the epitome of an absentminded professor, sporting a tweed jacket, round-rimmed spectacles, mustache and dishevelled hair. While exploring the nature of cathode rays, he discovered that he could deflect their path with an electric field. Measuring the amount of deflection under various strength fields, he was able to determine the mass of these particles, which he found to be about 1,800 times lighter than the hydrogen atom. He called these particles “corpuscles,” and (incorrectly) suggested that they make up all of the matter in atoms. Most scientists at the time believed that the atom was the most fundamental unit of matter and indivisible, so to them this was a shocking concept. 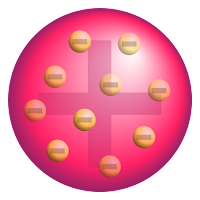 Thompson proposed a “plum pudding” model for the atom, in which thousands of tiny, negatively charged corpuscles move about inside a massless cloud of positive charge. 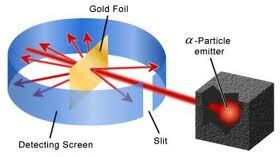 This theory was disproved by a former student of Thomson, Ernest Rutherford. 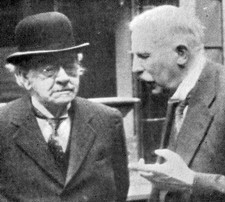 By examining how alpha particles scattered after colliding with a thin sheet of gold foil, Rutherford found that the atom must have a small core, or nucleus. Rutherford proposed that the atom might resemble a tiny solar system, with a massive, positively-charged center orbited by electrons. Luckily the name corpuscles did not stick or else today we would be going to corpuscular stores like Radio Shack, or reading c-mail instead of e-mail. Eventually the word electron gained favor. It comes from the Greek word for amber, which was known for its ability to electrostatically attract small objects when rubbed with fur.